Spyro’s back! Well almost back. That little purple dragon equipped with his smoldering attitude is now all scaled up in stunning HD as Spyro Reignited Trilogy game collection arrives on Xbox One and PS4 consoles next month. The collection includes the original three games, Spyro the Dragon, Spyro 2: Ripto’s Rage! and Spyro: Year of the Dragon. All for $40 bucks (usd). Great value for the buck if you ask us. Recently we had a chance to check out the game at the Toys for Bob studio in Novato, CA. They let us capture the Dino Mines level from Year of the Dragon and needless to say, it looks fantastic. Check out the raw gameplay here. 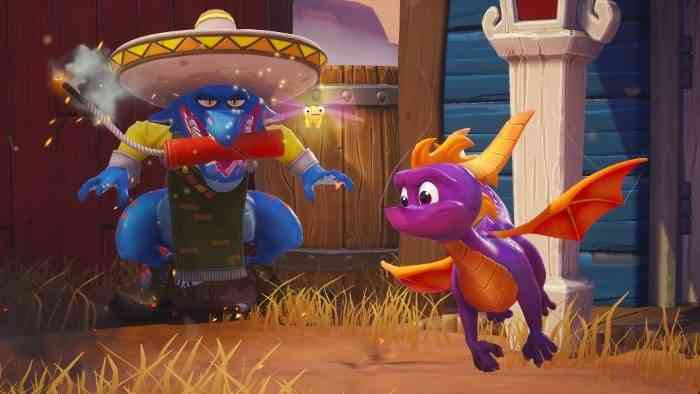 Remade from the ground up by lead developer Toys for Bob, the Spyro Reignited Trilogy features the fun and nostalgic gameplay that fans remember with more than 100 levels, enhanced reward sequences, Spyro’s gang of zany dragons and other goofballs (including Sparx the Dragonfly, Hunter, Sheila, Agent 9 and Sgt. Byrd) and more. The trilogy also includes improved environments, updated controls, brand-new lighting and recreated cinematics for added flavor in this one-of-a-kind adventure. Check out 9 reasons why you are going to love Spyro Reignited Trilogy HERE.